The European Hedgehog, Erinaceus europaeus, is covered with a thorny coat of spines on its back. An adult hedgehog can have up to 7,000 spines! When threatened, the hedgehog curls up into a tight ball where its spines serve as a prickly protection. The spines also act as shock-absorbers which protect the hedgehog from the impact of falls. The spiky armour of the hedgehog does wonders for its survival. Thus, hedgehogs that over ate at a Wildlife Rescue Centre during winter and were unable to roll into tight balls became too vulnerable to be released back into the wild (BBC, 2010). 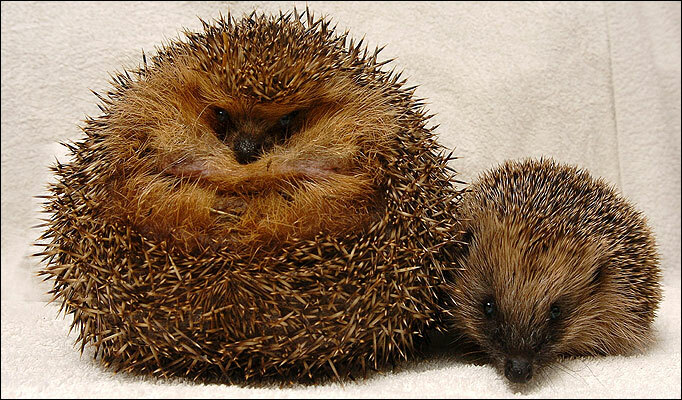 These pudgy hedgehogs were first put on strict diets. You might imagine that hedgehogs that can survive being misused as croquet balls in Alice in Wonderland are pretty hardy animals. Yet, the ability to curl up into a tight thorny ball does not make the hedgehog indestructible. Besides freezing winters that could kill them, badgers are also the archenemies of hedgehogs. Badgers, Meles meles, can poke their noses into the crease where the top and bottom of the hedgehog’s thorny armour meet and make the hedgehog their meal (Roberts, 2011). Ergo, a hedgehog’s spines are not the most effective defence against badgers. To avoid the badgers, hedgehogs resort to an “edge-refuging” behaviour (Hof et al, 2012). Simply, this means that they stick to edges where two habitats meet, such as hedges and field margins. Although hedgehogs could well move beyond these edges, they seek refuge in edge habitats because these are structured in a way that allows the hedgehogs to hide from their enemies. After all, hedgehogs are considered to be exotic animals and they do have to live on the edge in an environment full of predators with a taste for the exotic. Hof, A. R., J. Snellenberg & P. W. Bright, 2012. Food or fear? Predation risk mediates edge refuging in an insectivorous mammal. Animal Behaviour, 83(4): 1099-1106. “Diet success hedgehogs released into the wild,” by BBC News. BBC News Channel, 7 April 2010. URL: http://news.bbc.co.uk/2/hi/uk_news/scotland/tayside_and_central/8605866.stm (accessed on 4 April 2013). “Erinaceus europaeus,” by C. Roberts. Animal Diversity Web, 3 April 2011. URL: http://animaldiversity.ummz.umich.edu/accounts/Erinaceus_europaeus/ (accessed 8 April 2013). “Fat hedgehog put on a six-month diet,” by kellyhound. Documenting Reality, 16 November 2007. URL: www.documentingreality.com/forum/f2/fat-hedgehog-put-six-month-diet-6407/ (accessed 4 April 2013). HAHA so cute the picture of the hedgehog. how do the hedgehog go on diets? pity those plump ones. The overweight hedgehogs were put on calorie controlled meals and they also swam and ran! 🙂 Sounds so similar to how humans diet!! You can check out this link if you want to see how the hedgehog swims.